Wabi-Sabi Wisdom — Available on Amazon! The Kyosei team is proud to announce the publication of Andrea Jacques’ new book Wabi-Sabi Wisdom: Inspiration for an Authentic Life. We live fast-paced, imperfect lives, rushing to and from work and back again. Our Google Calendars are bursting. We’re juggling meetings, hobbies and family obligations with occasional rest. It’s no surprise then that many of us are exhausted and eventually succumb to stress. After all, how often does anyone really stop to take stock of what it all really means? Is there actually any bliss to be found in the imperfect moments of life? The Japanese have a word for finding beauty in life’s imperfect, transient moments. They call it wabi-sabi. As much a philosophy as a design aesthetic, wabi-sabi is reflected in traditional Japanese pottery, metalwork, architecture and other arts, but is also seen in Japanese attitudes to life, love and work. Japan has one of the highest life expectancies and healthiest populaces in the world. In Wabi-Sabi Wisdom, learn how the Japanese concepts of ikigai (the thing that gives meaning to your life) and shokunin (working with the passion of a master artisan) can work together to help you re-invigorate work, aging and retirement for an authentic, passion-filled life. In the west, balance is extolled as a virtue. But is balance really what moves a soul forward? Learn about heikō (balance) and simple methods for a more engaging, transformative existence that just might push you beyond the comfort zones you thought you always needed! Reveal through the Japanese concept of two faces — tatemae (your public face) and honne (your true and private self) — what the real face of an authentic, passion-filled life can feel like. Discover how you can find wa (harmony) — by working not just for yourself, but for the greater good. Wabi-Sabi Wisdom — on sale at Amazon today! 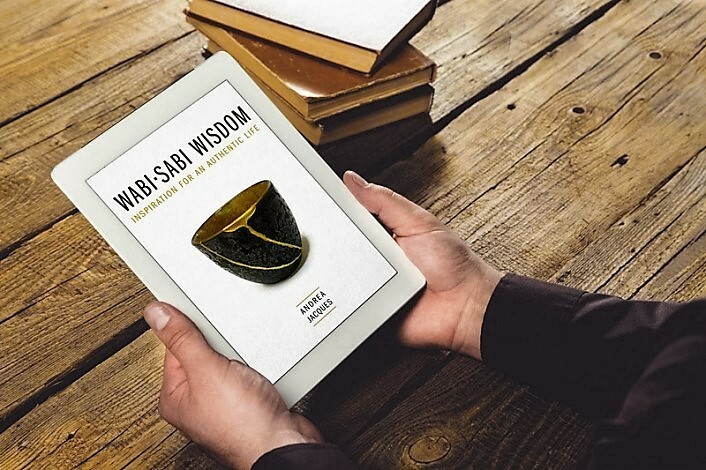 Wabi-Sabi Wisdom: Inspiration for an Authentic Life is one part meditation, one part self-help and one great read for anyone interested in a new perspective for personal growth. It’s available now as an Kindle ebook from Amazon — and free for Kindle Unlimited subscribers!